Urgent changes at an unprecedented level never before seen in human history are needed to save the planet from environmental collapse. Nova Scotia has responded to this clarion call from the world's leading scientists by paying a company to burn old tires. The Department of Environment announced today it’s awarded industrial approval for Lafarge Canada to burn 350,000 scrap tires as fuel for the company's Brookfield cement plant. Lafarge will receive $367,5000 in public money to subsidize its efforts. The license is only for a 12-month period. At least to start. Similar environmental approvals are normally granted 10 years at a time. “The shorter period allows the province to ensure that terms and conditions are being met, and can be modified if needed to ensure the environment and human health are protected,” writes spokesperson Bruce Nunn in a press release. But Ecology Action Centre policy director Mark Butler says once the fire is lit it will be hard to put out. “The EAC is of the view that once the tire burning infrastructure is in place at the Lafarge plant it will be difficult for government to reverse the decision to burn tires, regardless of monitoring and test results,” Butler writes via press release. Environment minister Iain Rankin first gave Lafarge Canada the go-ahead for its tire-kiln pilot project last summer. The decision was appealed by nearby residents and environmental groups who felt the province had failed to adequately consult the public and that Lafarge’s plans were based on shoddy science. The appeal was ultimately rejected by the courts. Research from Lafarge and Dalhousie University suggests that the global manufacturer can reduce its Brookfield plant’s greenhouse gas emissions by 30 percent just by switching from coal to scrap tires. Phasing out coal is one of the quickest methods countries around the world will need to take to reduce GHG emissions, according to a dire report released earlier this week from the world’s leading climate scientists. The authors of the UN Intergovernmental Panel on Climate Change study warn there are only 12 years left to keep the planet from warming an additional 1.5C and thus stave off catastrophic environmental failure. Achieving that goal will require urgent and unprecedented changes from all aspects of society, including a severe curtailing of greenhouse gas emissions. But Nova Scotia's scrap tires were already being reused as something more useful than coal-replacement. The old rubber would be chopped up by C&D Recycling and spread as infill in roadwork projects. Without a supply of tires, local engineers will instead need to use mineral aggregates. The mining of those products is considerably more carbon-intensive than any savings calculated by Lafarge, says Butler. Burning tires, even when carefully monitored, risks releasing toxic dioxins and dangerous heavy metals in the local environment. According to today's press release, Lafarge will have to undertake air quality monitoring at regular intervals whenever the tire kiln is lit. Groundwater and surface water monitoring is also required. Setting up those monitoring systems will be a little easier thanks to the $1.05 per-tire subsidy Lafarge will be paid by Divert Nova Scotia. The money comes out of an environmental fee Divert NS collects from consumers who buy new tires. “It is EAC’s view that Divert NS, which describes itself as fostering a culture of recycling in Nova Scotia for over 20 years, does not have the moral authority to collect a fee which will be given to a company to burn, not recycle, tires,” states Butler. Lafarge had previously put forward a tire-burning plan in 2007 but it was rejected by Nova Scotia’s Tory government for having too many risks. 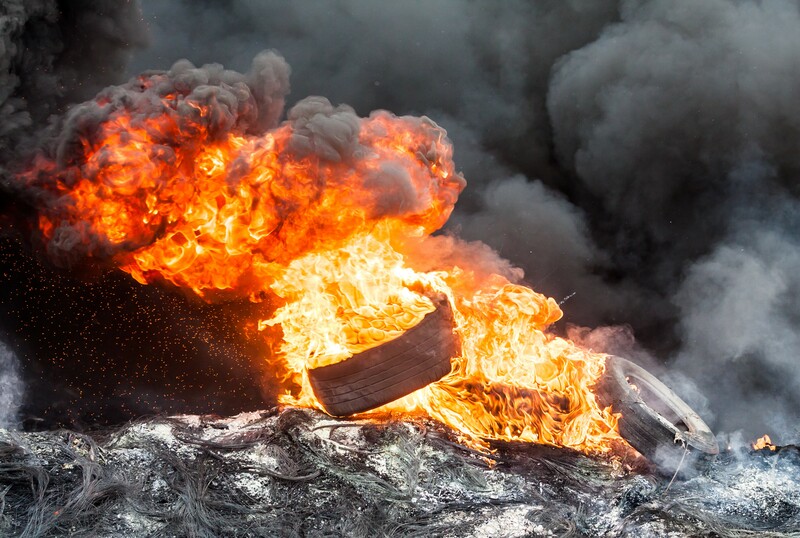 The following year, the legislature passed a bill outright banning tire burning in the province. It was never proclaimed. Today the NS NDP announced it will re-introduce that bill in response to the Liberal government’s Lafarge decision. Nova Scotia produces roughly 1 million scrap tires each year. Critics say the Canada–Nova Scotia Offshore Petroleum Board is letting the oil and gas industry regulate itself, and under new legislation it's only going to get worse. Blowout risks are 10 to 100 times worse than BP Canada's predictions, says international engineering expert. Additional input needed from experts in economics and international law before public release.